Live music is an extension of the area's natural beauty. Published Aug. 10, 2018 at 11:02 a.m. EGG HARBOR – Music springs from every corner of Door County. From the lapping waves to the chirping birds, the natural beauty of Wisconsin's sanguine peninsula is inescapable and inspirational. For some, this natural music has inspired a parallel range of musical experimentation up and down the peninsula. Carefree visitors from Milwaukee, Chicago and beyond have much to choose from on their journey through this magical county. From top-notch bar bands to legit live performances, from silly karaoke to serious songwriters, there's something for everyone nearly every night of the week throughout the summer. On my 25th consecutive summer visit to my favorite vacation spot in the state – and my favorite place anywhere, really – I caught a little bit of all of it. The entry point to Door County is, of course, Sturgeon Bay. And originally, that was the site of the historic Steel Bridge, which found itself in jeopardy until local music legend pAt mAcdonald (yes, that's how he spells it) stepped in. A bit of background on why you already know mAcdonald: He was a founding member of Madison's Timbuk3, which recorded the monster hit, "The Future's So Bright" in 1986. While mAcdonald is still wearing shades some 30 years later, that tune was much darker than its title would suggest. 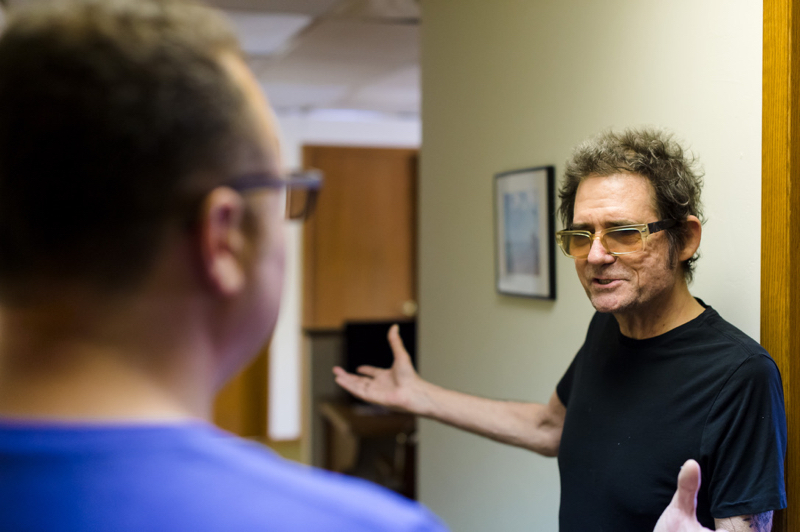 It was a serious song, and now he has a serious mission: The Green Bay native has dedicated his life to making Door County not just a better place, but a hub for songwriters and genuine musicians. Not only did he start the Steel Bridge Songfest in 2005 with friends like Jackson Browne, he took it one step further, creating the Holiday Music Motel. His partner, Milwaukee musician Melaniejane, joined in the business in 2010. The 1952 vintage motel, itself, stretches back to mAcdonald's time visiting here as a child. Says mAcdonald, "I just remember that was an iconic symbol of being on vacation. It was seeing the motel here and that sign, and that was the only way across to the county, that bridge. And eventually, this motel became a byproduct of our effort to save that bridge." With the bridge's future now secure, mAcdonald and Melaniejane have turned their occupation as innkeepers to an even more noble endeavor: creating a haven for great music and artists. 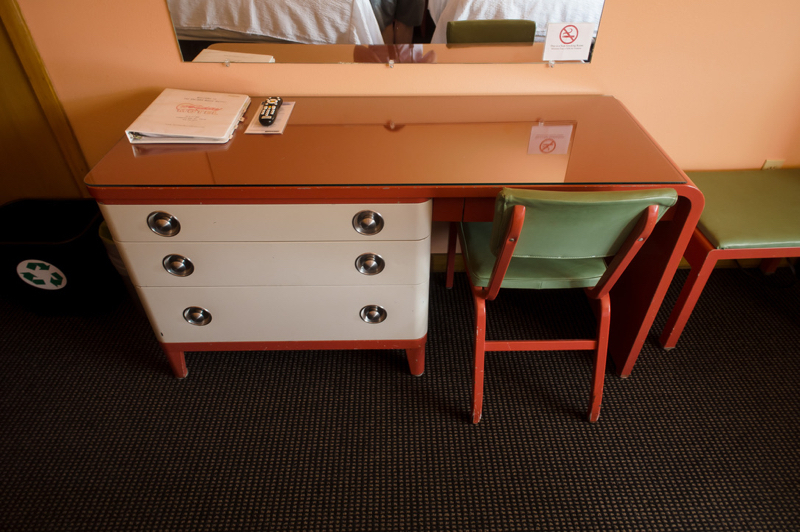 Step into this 18-room art deco motel, and you'll quickly realize this is not an ordinary place to lay your head. 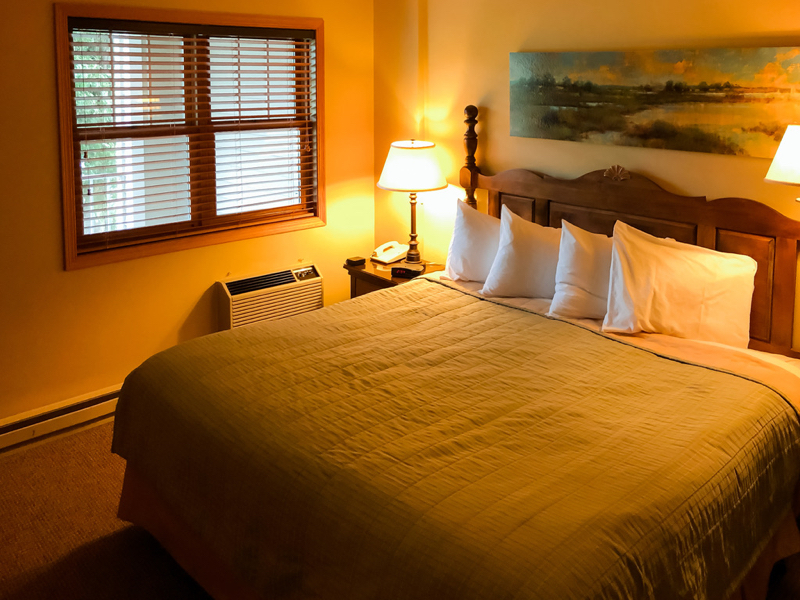 Sure, it's a real motel, complete with vintage furniture and unusually reasonable prices, but it's also a hub for three songwriting events each year. Love on Holiday (around Valentine's Day), Steel Bridge Songfest (summer) and Dark Songs (around Halloween) are invitation-only sessions for musicians, who create original works at the Tambourine Collaboratory and the Tambourine Lounge, while mAcdonald fine tunes them into polished songs. 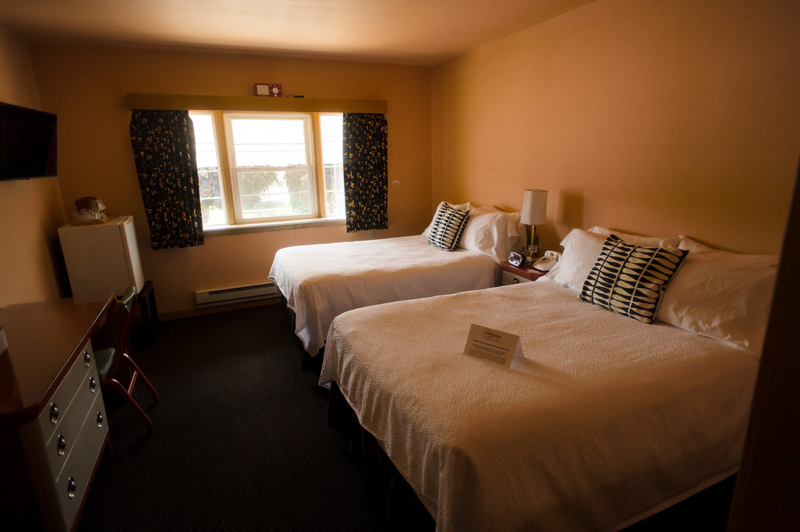 The motel also hosts workspaces and studios for musicians and even visual artists. "This is a labor of love," says mAcdonald, pointing out that the business side of the motel exists mostly to feed the creative side. "We house and feed them free for a week. They write, record, perform," says Melanjane. "They own their own songs. Having the music part involved and all the excitement that that brings – and the happiness that it brings to so many people – it really makes it worthwhile." Experiencing this creative endeavor as soon as we entered the peninsula was a perfect entree into our musical weekend. But the live music doesn't end in Sturgeon Bay. Halfway up the peninsula, in Fish Creek, the polished edge of Door County's music scene is on show, drawing topflight artists for such a tiny community. 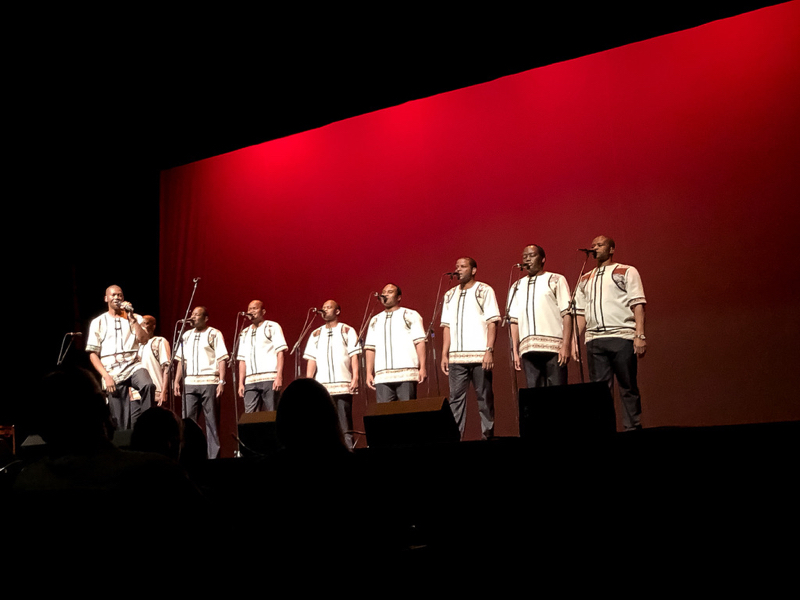 The weekend we visited, for example, the Door County Auditorium hosted Ladysmith Black Mambaza, the South African a cappella band best-known as the backing band on Paul Simon's "Graceland." This was an erudite crowd – quiet, seated and older – but the acoustics of the space were a perfect fit for the wonderful harmonies of this iconic band. Like everything else in Door County, it felt small and intimate: free parking in the Gibraltar High School. Easy in, easy out. Of course, we went further up still, to the area's hottest community right now, Sister Bay, which still sizzles with Husby's and its Garage. This is a hub for outdoor bar band music, encouraging the diverse crowd to get up and dance a bit on a beautiful night. On the night were there, the rain did eventually start falling, but it was a welcome reprieve after a long summer day of vacation. 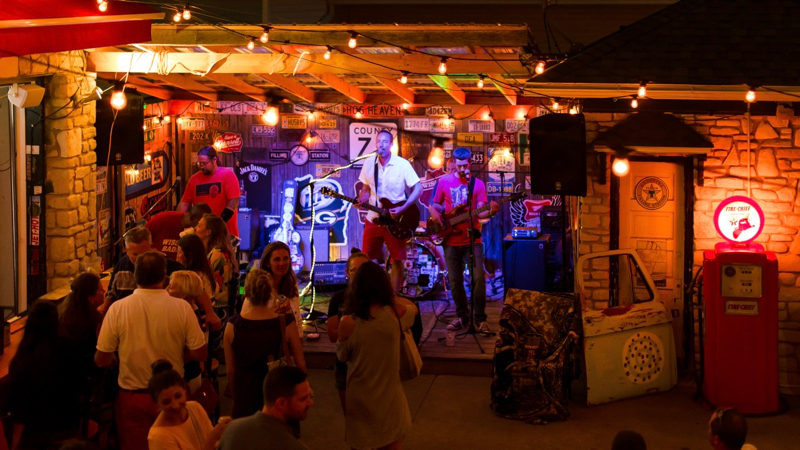 "I think many of the music acts we get either have a connection or know someone that has a connection to Door County," says the Door County Visitor Bureau's Jon Jarosh. "So not only is it a gig for them, it's a gig in a place they have ties to somehow. 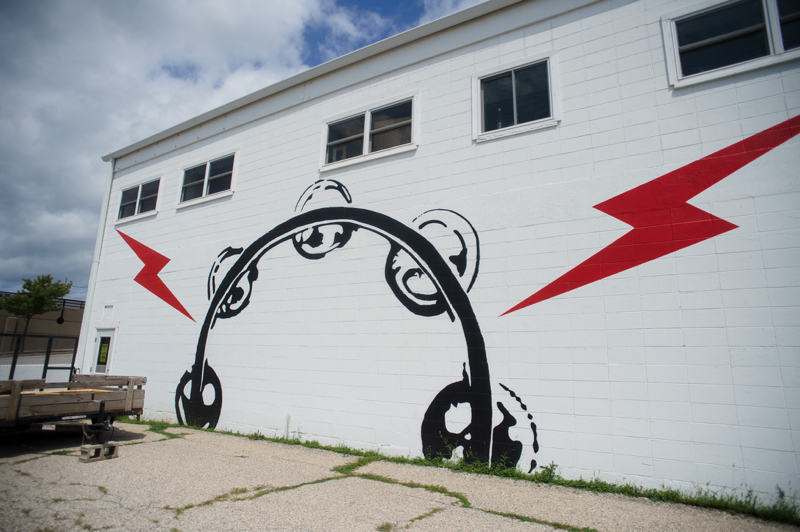 Add to that the welcoming vibe Door County has extended to artists of all kinds for decades, and it enables us to attract some very good music acts despite the fact that we have a relatively small year round population." Heading back south again, we had a chance to get back to our lowbrow roots: karaoke in Egg Harbor at both Mojo Rosa's and Casey's BBQ & Smokehouse – this is technically live music, but no one promised that it was in tune. It was just fun. On the way off the peninsula, we ambled back around Sturgeon Bay, peeking inside Door County Music Company. The owner's story was the same one we've heard hundred of times: he visited until the draw of this place made him stay. And now the former psychologist sells guitars to the very same musicians who play up and down Highways 42 and 57. Of course, a weekend in Door County is more than just music. With help from our friends at the Door County Visitor Bureau, we made our home base at the very comfortable Newport Resort in Egg Harbor. Our suite was large and clean, with a whirlpool bath and two bedrooms. I especially liked the availability of free bikes for visitors to explore the area, and with two pools and lots of room to roam, this is a hotel I'd stay at again. We found ourselves a little too busy to explore many new dining options this summer, so we stuck to old favorites: an amazing dinner at Mr. Helsinki in Fish Creek, a patio breakfast almost across the street at Pelletier's, and burgers at both Husby's and Poh's Corner Pub back in Sturgeon Bay. In such a short weekend, there wasn't much time for anything else. Other than some pies at Sweetie Pies, of course. By night, we took in a sunset at Fred & Fuzzy's, a Bernie shot at JJ's and a Malmo Mule at Stabur. Two nights barely felt like enough time. But we came on a mission, and found what we were looking for. In a place that exudes so much beauty, you can easily find things that are not just appealing to your eyes and your tastebuds, but also to your ears. We've known this place is magical and have spent the last 25 years trying to figure out exactly why. Talking to mAcdonald, you can hear his pride in playing his part to transform Door County into a musical destination. "There were good things happening but it didn't gel. Door County was known for visual artists primarily, not for music," he says. Through the Steel Bridge Songfest, the Holiday Music Motel and more, now it is. "It is something to be really proud of," says Melaniejane.